A727 702.50. Good Working Order. Made ByFiat. Relay assembly complete from a 2001 Sportwagon 2.4JTD. No 4 in the image. Part number: 46520429. From a right hand drive vehicle. This is a used car part which may show signs of normal age related wear however has been tested in full working order when removed from vehicle. Part No. : 7686773. 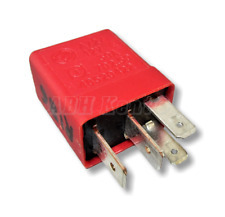 Grey Bitron Relay 12V 4 Pin. Bosch 12V 0332002174 Relay. Fits Alfa Romeo, Renault, VW, BMW E30, Lancia Thema. Any further questions regards the suitability of your vehicle please ask. FIAT PUNTO ALFA LANCIA RELAY. Need help?. ✔︎ QUALITY PRODUCTS AT REASONABLE PRICE. ⚑︎ NEWEST PRODUCTS. A727 702.30. Good Working Order. Made ByFiat. Alfa Romeo 156 Relay 50A A727 46520429 . Condition is Used. Dispatched with Royal Mail 2nd Class. Model:MITO LUSSO. Year: 2009. Body Colour: BLACK. Body Colour Code: NERO CATTIVO HWB / 601. Body Type:3 DOOR HATCHBACK. THIS ITEM IS COMPATIBLE WITH MANY OTHER VEHICLES. Alfa Romeo 156 (1997-2002) Relay 7676504. Condition is Used. Dispatched with Royal Mail 2nd Class. Various electrical relays from a 2001 Alfa 156 2.4JTD Sportwagon. Photos are for actual item.Item will be sold as it is shown in the pictures (you will receive exactly what you can see in the pictures). FOG LIGHT RELAY - 46409709. P/N - 51715726. MODEL 156 TURISMO. PAINT COLOR GREY 680. PART REMOVED FROM. ITEM CONDITION. NUMBER 2036 12 10/20A 87-17. ALL WORK CARRIED OUT ON ALFAS INCLUDING DIAGNOSTIC WORK AT COMPETITIVE PRICES. CALL 01706 228342. Your understanding and patience will be highly appreciated. However all marks considered bigger than normal wear will be listed. GOOD USED CONDITION. MARKS AS PER PICTURES. A727 702.30. GenuineFiat Part Note. NUMBER TRW SIPED B365 87-17. ALL WORK CARRIED OUT ON ALFAS INCLUDING DIAGNOSTIC WORK AT COMPETITIVE PRICES. CALL 01706 228342. SCOTTISH & ENGLISH OFFSHORE ISLANDS, NORTHERN AND SOUTHERN IRELAND, ISLE OF MAN AND ISLE OF WIGHT ETC. IV, HS, KA27-28, KW, PA20-49, PA60-78, PH17-26, PH30-44, ZE, BT, IM, TR21-25, AB, GY, JE, SCOTTISH HIGHLANDS. ALL WORK CARRIED OUT ON ALFAS INCLUDING DIAGNOSTIC WORK AT COMPETITIVE PRICES. GOOD CONDITION WILL FIT 10-16 P/N 55203394. 2018 Alfa Romeo Giulia 2016 On Quadrifoglio Bi-Turbo 2.9 8 Speed Automatic Petrol 4 Door Saloon Fuse Box All of our mechanical and electrical parts come with a 3 month warranty as standard, this covers the part itself but does not cover any labour charges incurred from fitment or removal of the item. (Terms and Conditions Apply). For extra peace of mind, extended warranties are available upon request at an additional charge. For more information please message us. Please be aware that all our items are removed from right hand drive vehicles unless otherwise stated. If you are unsure if this item will fit your vehicle or if you have any other questions then please call our parts department who will be happy to help. If you have any problems at all then please message us through eBay and we will happily help to resolve any issues. NUMBER 46409709 87-17. ALL WORK CARRIED OUT ON ALFAS INCLUDING DIAGNOSTIC WORK AT COMPETITIVE PRICES. CALL 01706 228342. NUMBER 46520422 87-17. ALL WORK CARRIED OUT ON ALFAS INCLUDING DIAGNOSTIC WORK AT COMPETITIVE PRICES. CALL 01706 228342. 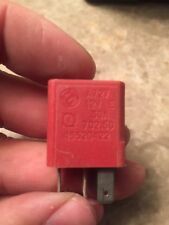 Genuine Fiat4 Pin Red Relay / Multi-Use Relay. Fiat Almost All Models from (2000-2016). Good Working Order. GenuineFiat Part. Used item in good condition. ✔︎ QUALITY PRODUCTS AT REASONABLE PRICE. ⚑︎ NEWEST PRODUCTS. Kept in secure dry storage. YELLOW MULTI USE RELAY - 82461739. BREAKING 1.6 TS 2001 5 DOOR HATCH SILVER 612/A-ALLOYS.